The build up of glucose within the body can trigger serious health complications including heart disease, kidney failure, blindness and can lead to amputations of limbs. Previously known as insulin-dependent, juvenile or childhood-onset diabetes as symptoms are usually presented at a young age. Characterized by deficient insulin production in the body, where insulin-producing pancreatic cells are attacked by the immune system. People with type 1 diabetes require daily administration of insulin to regulate the amount of glucose in their blood. If they do not have access to insulin they cannot survive. The cause of type 1 diabetes is not known and it is currently not preventable. Formerly called non-insulin-dependent or adult-onset diabetes, although it is increasingly reported in children. Results from the body’s inability to produce insulin or use insulin effectively. Caused by a combination of both genetic and environmental factors but is entirely preventable if diagnosed at an early stage. Symptoms may be similar to those of type 1 diabetes, but are often less marked or sometimes entirely absent. An epidemic, in the conventional medical sense, usually refers to an infectious disease affecting a larger number of people than would usually be expected within a limited geographical area. Diabetes is not an infectious disease and the prevalence is not limited to one region. There are currently 415 million people living with diabetes and this number is set to grow to 642 million by 2040.2 So, although the disease does not fit into the traditional definition of ‘epidemic’ it is safe to say that there is a crisis situation that requires direct and swift intervention. The global rise in the type 2 diabetes population is difficult to attribute to just one cause but there is a strong link to obesity and reduced physical activity. According to the European Association for the Study of Obesity (EASO), 44% of the diabetes burden is due to overweight and obesity, which if true would mean that over 182 million cases of diabetes couldbe caused by this serious issue. Some of the reasons there is such an increase in obesity is because of the popularity of energy-dense foods and an increase in the sedentary nature of common working practices, as well as a significant drive towards urbanization. Approximately 46% of people living with diabetes are doing so without a full and proper diagnosis.2 Because these people are unaware that they have diabetes they are unaware of how best to manage the disease and protect themselves from the severe long-term health complications. Allowed to go unchecked, diabetes can increase the risk of developing cardiovascular disease, kidney disease, nerve disease and eye diseases. This low to no maintenance approach to disease management is not only dangerous but also significantly contributes to health care costs both in the short and long term. In 2014 in the USA, an estimated $673 billion in health expenditure was allocated to diabetes and related illnesses which equates to 11% of total health spending on adults3, much of it due to improper management of the disease. The global expenditure on diabetes and related complications is thought to be over $827 billion3 but this number could be higher, especially as we start to better understand how the disease has developed across different populations. This map demonstrates the estimated global number of diabetes cases found in people from the ages of 20-79 years old in 2015 and the projected growth in each region up to 2040. The largest growth areas are the Middle East, North Africa and Africa where the numbers of people with diabetes are set to more than double over the next 35 years. South East Asia and Western Pacific, containing both India and China respectively, represent nearly half the world’s population. These regions will for the first time have diabetic populations in the 100’s of millions: A significant percentage of their population. Growth of diabetes in Europe and North America is set to slow but this is only after many years of dedicated education and intervention programmes. Feeling fatigued, headaches, confusion and anxiety. Hypoglycemia means the body is experiencing low blood glucose levels. Anything less than 4 mmol/l can be considered too low, but this needs to take into account other factors such as increased physical activity or excessive alcohol consumption. There is no definitive rule for when and why a person will experience hypoglycemia but it is usually due to a combination of factors that can include missing a meal or administering too much insulin. Symptoms are different for different people but, generally, are similar to extreme hunger and can include a fatigued feeling, anxiety, dilated pupils, headache, confusion and, in the worst cases, a loss of consciousness. Diabetic ketoacidosis (DKA) is the result of a lack of insulin required to process glucose. In response the body switches to burning fatty acids which produce acidic ketone bodies. Symptoms of DKA include a dry mouth and excessive thirst, frequent urination, high blood glucose levels and high levels of ketones in the urine. These symptoms are very similar to those found in those suspected of developing diabetes. This is because it is quite common for DKA to be the event that highlights that diabetes is present. Blood glucose levels rise (usually higher than 300 mg/dL) because the liver makes glucose to try to combat the problem. However the cells cannot pull in that glucose without insulin. Hyperosmolar hyperglycemic state (HHS) is, in many ways, the opposite scenario to hypoglycemia. Here the body is experiencing blood glucose levels over 40 mmol/l. HHS can be caused by a number of different factors but is often influenced by ineffectiveness of diabetes medication or general illness. Similar to the symptoms caused by DKA, HHS has a very different cause and therefore requires a more careful approach to treatment that is focused around reversing dehydration. Symptoms include urination, thirst, nausea, dry skin, disorientation and a gradual loss of consciousness. Cardiovascular disease (CVD) includes all diseases related to the heart and blood vessels, including strokes, heart failure and myocardial infarction (heart attack). The high glucose levels found in diabetics will, over time, cause damage to the walls of major blood vessels, leading to clotting and the narrowing of these vessels. When paired with other damaging practices such as smoking, a sedentary lifestyle and a carbohydrate-heavy diet, the chance for someone developing CVD is significantly increased. Diabetic retinopathy is caused by damage to the blood vessels in and around the retina of the eye. As with CVD, persistently high blood glucose levels leads to blocked, leaky or incorrect growth of the network of blood vessels around the retina. If retinopathy goes unchecked it can lead to blindness and is still the biggest single cause of blindness in those of a working age in the UK. blood vessels through exposure to high blood glucose levels. This damage does not allow essential nutrients to reach the nerves that carry messages between the brain and the rest of the body. One of the most common symptoms of sensory neuropathy is tingling or numbness in the extremities. This in itself leads to a loss of sensation meaning that injuries go unnoticed, leading to infection and potential amputation of limbs. Diabetic kidney disease (DKD) or nephropathy is when the kidneys fail to regulate the amount of fluids and salts in the body. In people with diabetes this is usually due to vascular damage and tends to happen over a very long time. DKD is potentially fatal and requires constant monitoring as it can progress with very little symptomatic change, eventually leading to full kidney failure and dialysis treatment. There are multiple options for the diagnosis of diabetes, most of which involve measuring the level of glycemic control a person exhibits i.e. how much glucose is present in their blood. Another option is to use glycated hemoglobin (HbA1c). For some time now it has been accepted that HbA1c can be used to not only manage glycemic control but also for the diagnosis of diabetes6. In 2011 the World Health Organization (WHO) reviewed their previous decision to recommend HbA1c as diagnostic marker for diabetes. glucose administered in an oral glucose tolerance test (OGTT). WHO have approved HbA1c for the diagnosis of diabetes with a Point-of-Care-Testing (POCT) device as long as the test is carried out by a trained professional adhering to an appropriate External Quality Assurance (EQA) scheme and using a methodology that is traceable to the IFCC reference method. This decision by WHO has significantly impacted the diabetes diagnostic landscape; previously lab-based HbA1c tests did not offer much of an advantage over fasting glucose or OGTT diagnosis techniques in terms of time and added-value. However, now POCT HbA1c tests can give a strong indication of not only diabetes but also pre-diabetes in a timeframe where intervention can be made immediately. Many of the same tests that are used for the diagnosis of diabetes are also used to monitor and maintain the progression of the disease over time. Self-monitoring of blood glucose on a daily basis is an important part of many people with diabetes’ routine, especially before and after eating. This is often achieved through the use of blood glucose meters (BGMs) where the finger is pricked, producing a small drop of blood which is added to a test strip and inserted into a handheld glucose analyzer. Where individuals are struggling to manage glycemic control it is recommended that they be considered for Continuous Glucose Monitoring (CGM). During CGM, glucose test sensors are placed under the skin so that the glucose can be measured in the interstitial fluid 24 hours a day. CGM means finger prick blood measurements are not required and insulin can be administered as required either through injection or an insulin pump. 6 monthly intervals once the HbA1c level and blood glucose lowering therapy are stable. Hemoglobin is a protein found in the red blood cells. Its job is to carry oxygen from the lungs to all other parts of the body. Hemoglobin also has the ability to bind with glucose in the bloodstream; this type of bonding is called glycation. The glycation process is irreversible so glycated hemoglobin (HbA1c) remains in its evolved state for the lifespan of the red blood cell - approximately 8-12 weeks. By measuring the amount of HbA1c in the blood it is possible to determine average blood glucose control over an 8-12 week period. The more HbA1c in your blood, the less controlled a patient’s diabetes is and the more susceptible they are to developing long-term health complications. From 1983 to 1993 the Diabetes Control and Complications Trial (DCCT) was conducted by the National Institute of Diabetes and Digestive and Kidney Diseases (NIDDK). This study was the biggest and most comprehensive of its kind at the time involving 1,441 volunteers and 29 medical centers spread across the United States and Canada.The study demonstrated that by keeping HbA1c levels as close as possible to the value of 6% or less significantly slowed the onset and progression of the eye, kidney, and nerve damage caused by diabetes. Since the DCCT, further studies have been carried out across the globe which have replicated and confirmed the findings reported by the DCCT leading to the standardization of the HbA1c assay through a harmonized reference method developed by the International Federation of Clinical Chemistry and Laboratory Medicine (IFCC). Both fasting glucose and OGTT have always been reliant on two factors; patient compliance and appropriate administering of the test. The fasting glucose test requires the patient to fast for a minimum of eight hours before the test is administered. This method is problematic as it is easy for the patient to consume food or drink without giving thought to the impact this will have on their blood glucose level. The OGTT requires the patient to ingest a glucose concentration drink with a known value and then return two hours later for a plasma glucose test. The issues here center around the patient returning to the clinician in the time frame allowed or impacting the test by eating or drinking during this period. Monitoring HbA1c is a measure of only the glucose that has bonded to the red blood cells over the previous 8-12 weeks. It is not impacted by the same issues as blood glucose monitoring. The ingestion of glucose before the test has no impact on the result, and there is no waiting time involved. As a result HbA1c testing is becoming the preferred technique for diabetes diagnosis. HbA1c testing is fast becoming the preferred technique for diabetes diagnosis. The treatment and management of diabetes is a lifelong endeavour and unlike most illnesses, the treatment is primarily self-managed. Treatments are individualized based upon a number of factors and can change with the requirements and lifestyle of the individual. The bedrock of any diabetes management programme is diet and exercise based but there is no single rule. A diet plan will need to be developed for each person’s needs and adjusted according to how glycemic control, monitored through HbA1c, has progressed. All people with type 1 diabetes will need to take regular infusions of the hormone insulin, either in the form of human insulin or an insulin analogue. Insulin can be administered either by injection with a needle and syringe/insulin pen or by an insulin pump. Both methods have their merits and draw-backs and the decision on which is best should be something that is agreed through consultation with an appropriate healthcare professional. NICE has produced guidelines for the treatment of diabetes using insulin pumps. Those with type 2 diabetes are less likely to be administering insulin. Instead patients use medication in combination with diet and exercise to better utilize or increase the body’s own insulin production. One of the most prevalent medications used upon a diagnosis of type 2 diabetes is Metformin Hydrochloride. The drug decreases glucose production by the liver and increases the insulin sensitivity of body tissues9, reducing the rate of complications caused by diabetes. DPP4 (Dipeptidyl peptidase-4) inhibitors, also known as Gliptins, block the production of the enzyme Dipeptidyl peptidase-4, which destroys the hormone incretin. Incretin regulates insulin secretion in response to meals; if it is available then more insulin will be produced. Drugs have now been formulated that act in a similar manner to incretin hormones. GLP-1 (Glucagon-like-Peptide-1) agonists, mimic the functions of the most abundant incretin hormones. 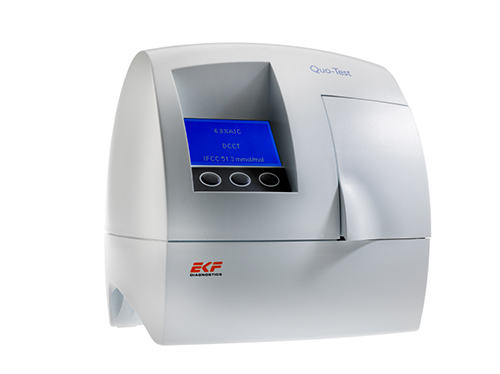 EKF Diagnostics strives to improve patient access to diabetes care techniques through the provision of affordable, easy-to use POCT analyzers and chemistry assays. Our products reduce the cost of long-term healthcare of the diabetic and pre-diabetic population. 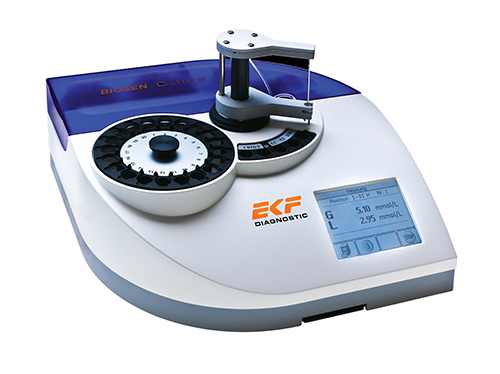 The Biosen C-Line and S-Line series of glucose analyzers are a familiar brand name in laboratories and diabetes clinics. Biosen uses chip sensor technology to provide fast and highly accurate glucose results at a low cost. Our HbA1c point-of-care analyzers, Quo-Test and Quo-Lab, are designed to deliver results that meet the requirements of NGSP and IFCC for point-of-care HbA1c analyzers within four minutes. 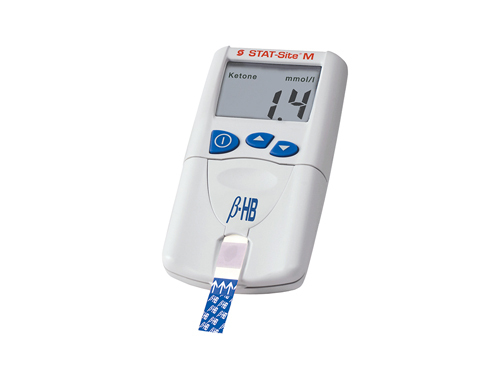 STAT-Site M B-HB is a hand-held, strip-based analyzer intended for the quantitative determination of Beta-Hydroxybutyrate in serum or plasma to aid the diagnosis and monitoring ketoacidosis. 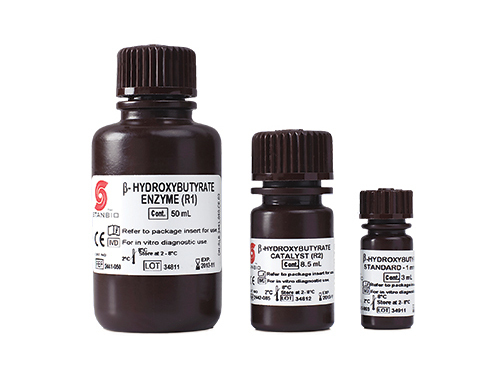 Beta-Hydroxybutyrate LiquiColor® Reagent is an automated, quantitative ketone test that can provide earlier detection and braking of clinically significant ketosis. Alberti KGMM, DeFronzo RA, Zimmet P, editors. International textbook of diabetes mellitus. 2nd ed. Chichester; New York: J. Wiley; 1997. IDF DIABETES ATLAS Seventh Edition 2015. A global systematic review. PharmacoEconomics. 2015; 33(8): 811–31. Diagnostic Criteria and Classification of Hyperglycaemia First Detected in Pregnancy. United Nations. Geneva, Switzerland; 2013. Definition and diagnosis of diabetes mellitus and intermediate hyperglycaemia. World Health Organization (WHO)/International Diabetes Federation (IDF); 2006. Use of glycated haemoglobin in the diagnosis of diabetes mellitus. World Health Organization (WHO); 2011. Continuous subcutaneous insulin infusion for the treatment of diabetes mellitus. Technology appraisal guidance. National Institute for Health and Care Excellence (NICE); 2008. “Metformin Hydrochloride”. The American Society of Health-System Pharmacists; 2017.